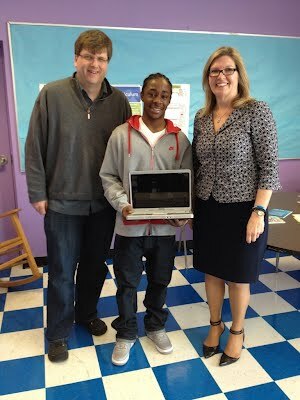 Today's recipient of a Give Laptops computer is an amazing young man named Tramaine Williams. He is the 2011 Golden Gloves National Boxing Champion and is working really hard to get enough credits to graduate from New Horizons High School in New Haven Connecticut even though he has a very demanding travel schedule. His teacher Merrie Harrison is working with Tramaine to complete his lessons remotely on his new GiveLaptop.org computer. He is very interested in starting a business when he graduates. Congratulations Tramaine. We love to see students with such talent and drive!